Despite the abundance of cameras, no one published the scene of her drawing a knife and being shot. The photographs only depicted the moments before and immediately after. The picture of the knife with a blue and yellow handle, lying on the floor at the scene of the attack, was mysteriously missing from the video footage. Al-Hashlamon’s death caused a frenzy on social media, which referred to her as a glorious chaste martyr – a woman who was shot to death for the “crime” of Islamic modesty. The narrative evolved that she was shot because she refused to take off her niqab. As the first female shaheeda of this terror wave, she became an icon, her image spread all over the media. One man even posed in front of Mecca’s Kabba with her name scrawled on a piece of paper and declared her the “detonator” of the current uprising.7 Her funeral filled the streets of Hebron with women in hijabs and niqabs prominently marching with her picture aloft. Social media was ablaze. When two Israeli parents, Eitam and Naama Henkin, were murdered by Hamas in front of their children in their car on October 1, Palestinians posted pictures of the bloody car and declared: “Revenge for our sister” [al-Hashlamon], and hashtagged her name. A road has since been named after her and a commemorative stone has been erected in al-Hashlamon’s honor near Hebron. Halabi continues to serve as a role model in the territories, with the Palestinian Authority, PIJ, Hamas, social media, and even the Palestinian Bar Association touting Halabi as a national hero. 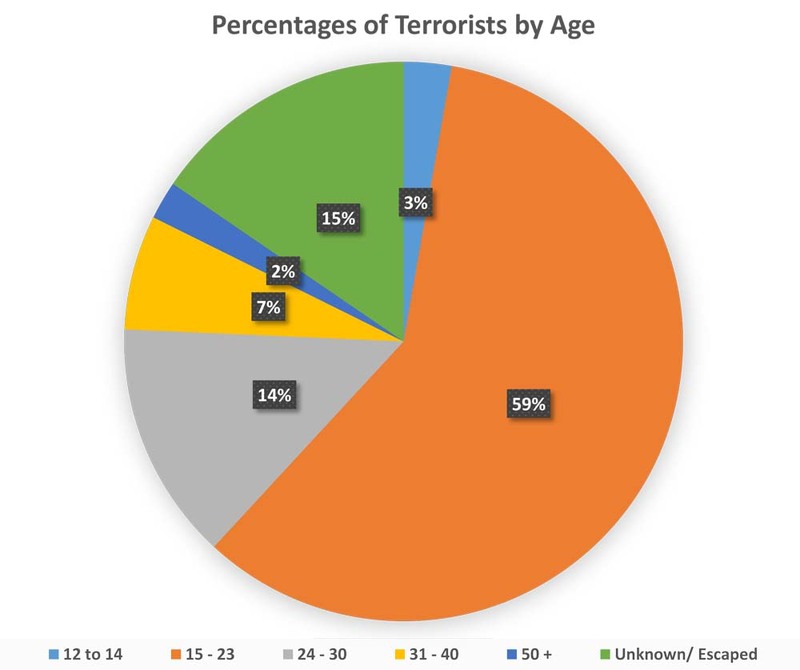 Some 59 percent of the attackers were between the ages of 15 and 23. The average age is 22, and the median age is 21. The attackers were mostly unmarried; only 17 out of 181 were married, while four were engaged to be married. Many were high school students or recent graduates, employed at low-paying jobs or unemployed, while some were university students. Most were male; only 22 (12 percent) were women. Almost none had a previous security record. Where Were the Terrorists From? Hebron and the surrounding district are overrepresented. “Above and beyond other cities in the West Bank, society in Hebron is very closed,” explained Majed (last name withheld), a language teacher at Hebron University. “People here are startlingly traditional. There is something called faz’ah, or a call to arms. ‘How could my neighbor be killed without me doing a thing?’ is part of the culture here.” Majed cited tribalism and a low level of education playing a crucial role as well.31 These reasons could explain the conspicuously high number of terrorists originating from the Hebron area. 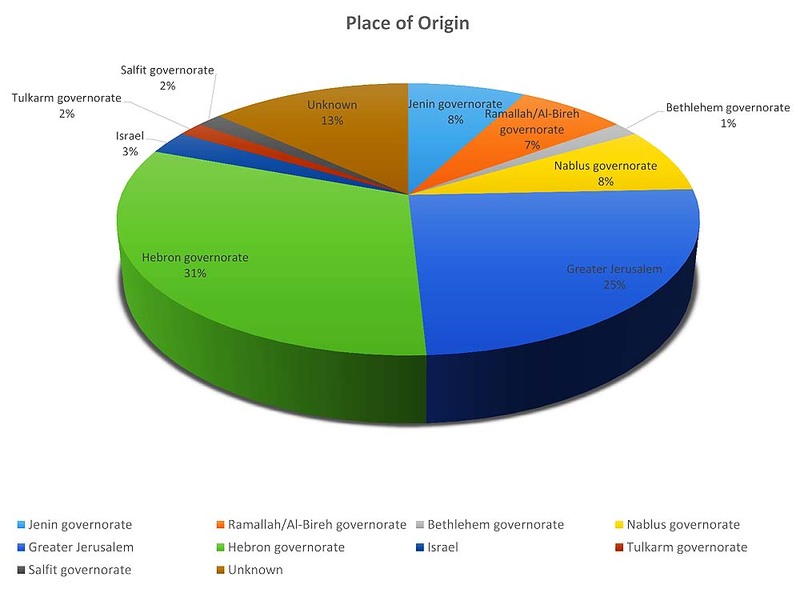 The greater Jerusalem area accounted for 25 percent of the attackers (numbering 45). Who Honors the Terrorists? Who Takes Responsibility for Them? One characteristic of the current uprising is the terrorists’ lack of clear organizational affiliation. For each martyr, multiple groups often send out simultaneous death notices. Perhaps the best way to discover their true political affiliations is at the funeral procession. Bodies are never wrapped in multiple flags signifying different political factions at a funeral procession. The shroud that covers the body points to a definitive claim by an organization or lack thereof. According to analyst Pinhas Inbari, if a member is affiliated with Hamas, the dead body is wrapped in the iconic green flag of Hamas. Hamas would very rarely wrap anyone associated with them in a shroud of the Palestinian flag. Due to its roots in the Muslim Brotherhood, nationalistic symbols like the Palestinian flag would be avoided in burial ceremonies because of Hamas’ desire for an Islamic caliphate. Fatah and the Palestinian Authority, on the other hand, tend to shroud their dead in the signature yellow flag of Fatah. Affiliation: Unknown. During interrogation he claimed he had gone to carry out the attack wrapped in a Hamas flag. He claimed he got it when he participated in the “Al-Aqsa mosque is in danger” rally in Um el-Fahm before the attack. Background: Headed the squad. He threw the stones that hit Alexander Levlowitz’s car. Occupation: Worked at a supermarket. Honored by: Facebook page of Palestine Dialogue Forum (PALDF). Official Fatah bulletin declared the attack carried out by their operatives. Muhannad Shafiq Halabi, 19, unmarried, from Surda, north of Jerusalem. Law student at Al-Quds University in Abu Dis. Motivation: Abd al-Aziz Mar’i was detained on the suspicion of having initiated the attack. He accompanied Halabi and helped him enter Israeli territory illegally to pray at Al-Aqsa mosque. When prevented from entering Al-Aqsa, Mar’i convinced Halabi to carry out the attack and bought the knife for him. Halabi watched a video of women being blocked from entering Al-Aqsa before he went out to attack. His father claimed that he defended the honor of the women of Al-Aqsa (Electronic Intifada/ Palwatch). Background: Halabi wrote on his Facebook page: “As far as I can see, the third intifada has begun….What is being done to Al-Aqsa is also being done to our other holy sites. What is being done to the women of Al-Aqsa is also being done to our mothers and sisters. I do not think the [Palestinian] people will accept the humiliation….The Palestinian people will wage an intifada. In fact, it is waging an intifada.” According to reports he was greatly influenced by the death of his friend Dhiaa’ al-Talahme. He attended the funeral, kissed the corpse and sought to avenge his death (Jerusalem Brigades website). Honored by: PIJ claimed Halabi as an operative. A PIJ banner hung on the mourning tent erected in the village of Surda. On October 10, 2015, the council of the Palestinian Bar Association decided to award Halabi a posthumous honorary LL.D degree, claiming he excelled at his studies. He became honored by many as a role model. Background: He lived in Jerusalem with his father. Mother and brother lived in Jordan since their request for family unity was denied. Fadi’s father raised him alone (Al-Jazeera). Became a role model and many Palestinians who carried out terrorist attacks posted his picture on their Facebook pages, claiming they were following in his footsteps. Background: Described as gentle, childish, and loving life, and wanted to be a teacher. Motivation: Two days before the attack he changed his Facebook profile picture to a picture of the Al-Aqsa mosque. Not religious. Affiliation: The Fatah branch in Yatta issued a death notice for him, claiming he was a Fatah member, and also organized his funeral in Yatta. Personal background: Mother lived in Hebron. Dropped out of school in the 10th grade to help his father at work. Background: Customarily prayed at the Temple Mount. Relatives described him as a well-balanced person, easy to get along with, well liked and helping everyone. He recently began saving money to get married. Honored by: A Facebook page created to commemorate him features verses from the Quran. Motivation: The day before the terrorist attack, he decided to participate in the Palestinian national and religious struggles by stabbing Jews. He sent an SMS indicating his intention to become a shaheed. Background: A resident of Shuafat wrote on his Facebook page that when he was 11 years old he threw stones at IDF forces that entered the camp. Background: She did not intend to carry out a stabbing attack but waved the knife in the air to commit suicide. Her father is an imam in Nazareth. Emotionally unstable/suicidal tendencies. Affiliation: Hamas issued death notice for him. Affiliation: Fatah (issued a death note for him). Alaa’ Ra’ed Mahamid (Zayoud), 20, unmarried, from Um el-Fahm near Hadera, in Israel. Carried an Israeli ID. Motivation: He participated in the mass “Al-Aqsa mosque is in danger” rally held in Um el-Fahm. The rally was orchestrated by Ra’ed Saleh, head of the northern branch of the Islamic Movement in Israel. Motivation: “I went there to stab Jews,” he told investigators at Hadassah Hospital where doctors have been treating him for wounds he sustained during the incident, police said. “I came with my cousin Hassan. He brought the knives and I agreed to join him” (Times of Israel). Background: “My son cannot stab, he doesn’t know how to hold a knife,” Ahmed Manasra’s father said. Motivation: The elder cousin reportedly confessed to the crime and said he was retaliating for the death of a relative in October, who was shot dead outside Jerusalem’s Old City after stabbing three policemen. “I decided to kill Jews to take revenge for Mohammed’s death,” he told his interrogators, according to Channel 10 (Times of Israel). Background: Believed in Palestinian nationalism. Initiated a campaign for a human chain of Palestinian youth around the walls of Old City of Jerusalem to enter Guinness Book of Records. Motivation: He wrote on his Facebook page that he was ready to sacrifice his life for the “homeland.” He also wrote that he wanted to be a shaheed. Honored by: Palestinian Bar Association and its council issued a death notice for the “heroic shaheed,” son of a Palestinian lawyer. Background: Student at Al-Quds University in east Jerusalem. His father comes from Jenin, lived in Jerusalem together under family unification. Background/Motivation: He was the cousin of two terrorists who carried out the mass-killing attack at the Har Nof synagogue on Nov. 18, 2014. Background: Affluent apolitical family. He led a secular life and was affiliated with Fatah. Motivation: On Oct. 5 he replaced his Facebook profile picture with one of Yasser Arafat and his Facebook cover with a picture of a Hamas terrorist operative with Al-Aqsa mosque in the background and the slogan, “At your orders Al-Aqsa.” He wrote that he wanted the flag of Palestine flown at his funeral. He dreamed of dying as a shaheed near Al-Aqsa. His brother said he changed his lifestyle, left the house less frequently and had become very quiet. He smoked, dressed in regular clothing, was an enthusiastic soccer fan, and liked playing cards and pool. Security Record: Released prisoner. Detained April 29, 2012, and sentenced to three years in jail. Affiliation: Hamas issued a death notice for him. His father is a retired PA Preventive Security Forces officer. The PA gave him a formal military funeral and his body was carried on the shoulders of operatives in the Palestinian national security forces. Motivation: He joined the “Haters of Israel” Facebook page. He used his Facebook page to support the popular resistance, and glorify terrorists who had been killed in the current terrorist campaign. He also posted pictures of rifles and pistols. Background: Won the Union of Palestinian Universities tennis championship. Wanted to become a professional tennis player and enter other competitions. Background: Involved in clashes with IDF forces and in throwing stones. Affiliation: Hamas issued death notice for him. On his Facebook page he affiliated himself with Fatah. Honored by: Hamas issued death notice for her. Facebook page of the Islamic Bloc at Hebron University has a poster dedicated to her. Background/Affiliation: He had been in contact with Hamas operatives for a long time and had carefully planned and prepared for the attack. His cellphone had pictures of Hamas operatives and weapons. His uncle, Sheikh Osama al-Uqabi, is the head of the Islamic Movement in the Negev. He was detained by the Israel Police in 2014 and at the beginning of 2015 Jordan prevented him from entering its territory. His mother is from Nuseirat in Gaza and received an Israeli ID under family reunification when she married his father. Motivation: He called during a Friday sermon for massive numbers to go pray at Al-Aqsa and condemned Israel’s activity. Motivation: On Oct. 4, 2015, he changed his Facebook profile picture to Fadi Aloun (who carried out a stabbing attack and became a symbol). On Oct. 17, changed his Facebook cover to a picture of the terrorist who disguised himself as a member of the press corps (Iyad Khalil al-Awauda). Motivation: The day before he carried out the stabbing attack he posted a quotation from a hadith (the Muslim oral tradition) on his Facebook page which read, “The man who speaks when the muezzin calls the faithful to prayer cannot say the shahada upon his death. If you do not speak [the word] know that your sins prevented you from doing it. I swear by Allah that I will tell this to ten people. There is no God but Allah and Muhammad is his prophet. Do not forget that this is what you swore.” The authenticity of the hadith is not considered particularly reliable, but its use may indicated that Mu’taz had a certain amount of Islamic orientation. Affiliation: Hamas issued a death notice for him, claiming he was a member of the organization. However, the Palestinian Ministry of Health in Ramallah and the Palestinian Prisoners’ Club claimed he was still alive. Background: The Palestinian media reported he was critically injured and hospitalized in Israel. Affiliation: Hamas operative; under his clothes he wore an Izz al-Din Qassam Brigades T-shirt; activist in the Islamic Bloc, Hamas’ student wing. Background: Student at the Al-Rayan High School in Hebron. Her father said she went to the Cave of the Patriarchs to pray every day after school (Al-Jazeera). Honored by/Affiliation: Hamas issued a death notice for her. Facebook page of PALDF has her death notice. Honored by: Hamas issued a death notice for him. Ibrahim Ramadan, governor of Jenin, sent Mahmoud Abbas’ condolences to the family. Attallah Kheiri, PA representative in Jordan, sent a formal communique expressing his condolences to the family. Background: Comes from a family of Hamas operatives. Wounded during the stabbing attack, escaped and sought refuge in Al-Ahli Hospital in Hebron. On Nov. 12, 2015, Israeli commandos abducted him and brought him to a hospital in Israel for treatment. Motivation: He posted two notices on his Facebook page before the attack. One was a picture of Palestinian terrorist Dania Irshid, killed while carrying out a stabbing attack in Hebron. He wrote, “Imagine she is your sister.” The other was a poem encouraging stabbing attacks to liberate Al-Aqsa mosque and Jerusalem. Security Record: Served a 16-month prison term in Israel for Hamas activities. Honored by: Hamas issued a death notice for him. YouTube video with a picture of al-Quds posted when he was in Israeli jail. Poster of him by Islamic Bloc at Hebron University. Honored by: Fatah’s Shabiba Facebook page has poster of death notice. Motivation: He posted notices on his Facebook page calling for violence against Israel and praising shaheeds. A few days before the attack he posted a notice calling on Palestinians to “shake Israel’s security.” The day before he died he wrote that “the heavens weep for the shaheed’s.” He posted pictures on his Facebook page showing him in Jerusalem and Tel Aviv. Honored by: Hamas death notice for “a shaheed of Palestine” (Facebook page of the Islamic Bloc in Hebron University). Motivation: His brother, Basel Sidr, was killed on Oct. 14, 2015. His cousin, Malek al-Sharif, was killed while attempting a stabbing attack at Gush Etzion junction. Honored by: Hamas issued a death notice for him “mourning the death of a shaheed of Palestine” (Facebook page of the Islamic Bloc at Hebron University). Honored by: Hamas issued a death notice for the “heroic shaheed” (Facebook page of the Islamic Bloc at Hebron University). Honored by: The PA’s representative in Jordan, Atallah Kheiri, sent a formal communique expressing his condolences to the family (Facebook page of Qabatiya Online). Background: Wounded while attempting a stabbing attack riding on his motorcycle. Honored by: Mahmoud was given a formal military funeral by the PA. His body was carried by operatives of the Palestinian national security forces. One picture shows his body draped with a black PIJ flag. Atallah Kheiri, the PA representative in Jordan, sent a formal notice of condolence to the family (Facebook page of Qabatiya Online). Honored by: Hamas and Fatah individually issued death notices for him. A video released after his death shows him clashing with IDF forces. He is seen throwing a stone at an IDF vehicle. His cousin Aweis al-Faroukh is a police officer and PA police commander in the village of Idhna, west of Hebron. Hamas death notice posted (Facebook page of the Islamic Bloc in Hebron University). Occupation: Unknown. A picture on a Palestinian news site show him as a photographer working for the Palestinian Red Crescent. Background: After the attack he turned himself in to the Palestinian security services, claiming the incident had been a traffic accident (a claim often made by Palestinian terrorists who carry out vehicular attacks). Honored by: The PA held a formal military funeral for him. His body was carried by operatives of the Palestinian national security forces. Motivation: According to his Facebook page, among the events influencing him was death of Palestinian terrorist Dania Irshid near the Cave of the Patriarchs in Hebron. He wrote, “Don’t be sad. The battalions of vengeance are coming.” A few minutes before the attempted attack he called his mother and asked for her forgiveness, saying he planned on becoming a shaheed. He also called his father and his aunt, who was the mother of two Palestinians killed in the current terrorist campaign: Basel Sidr (killed on Oct. 14, 2015), and Farouq Sidr (killed Oct. 29, 2015). Ten minutes before the attack, Malek Sharif phoned his father in Hebron. “Dad, I want you to be pleased with me. The last words I want to hear in my life are ‘God is pleased with you.’” Father implored him to come home. Malek said, “It’s done. I’ve prayed to God and I can’t go back.” Revenge was key in his decision for Farouk and Basel Sidr, his father said. He posted a prayer for his mother not to be sad and a wish to meet the “lovely-eyed maidens” who await martyrs in heaven. He posted a photo of Sheik Ahmad Yassin, the founder of Hamas, saying, “The children around you have grown up, O Sheikh; matured to the stage where they can bomb Haifa and Tel Aviv” (Tablet Magazine). Hamas death notice on Facebook page of the Islamic Bloc – Nablus. Motivation: He posted a video on his Facebook page showing himself sitting in front of the flags of Fatah and its military wing. In it he claimed he was wanted by the Israelis and that he belonged to Fatah’s military wing. He carried out the attack “to defend Al-Aqsa mosque and for the sake of the Palestinian people and to defend the occupied land of Palestine.” He claimed he carried out the attack without being directed or pressured by anyone. Postings on his Facebook page called for an uprising, a struggle for the sake of Al-Aqsa mosque, and revenge for the deaths of Palestinian attackers. A day after the attack he turned himself in to the Palestinian security services. Honored by: Hamas issued death notice for her. Ismail Haniyeh, deputy head of Hamas’ political bureau, spoke to the family and expressed his condolence (PALDF forum). The Palestinian media issued a false report of her death, claiming the IDF had “executed” her for no reason. Honored by: Fatah issued a death notice for him. According to the family, he was not a Fatah operative. Formal Fatah death notice for Suleiman appeared on Facebook page of QudsN (Oct. 8). Fatah death notice also features Dome of the Rock. Motivation: His older brother said that since the current wave of terrorism began he had gone to the Al-Bireh area every day to throw stones and clash with Israeli security forces. His cousin said that on several occasion Suleiman said he wanted to die as a shaheed. Pictures show Suleiman with M-16 and another with Arafat photo, Fatah flag to the right, and picture the Dome of the Rock to the left. Motivation: Relatives say he saw the leaked video clips of Ahmad Manasra (Israeli police yelling at him). Uncle Abu Nimer Alqam said, “Anyone who saw that clip would want to go out and seek revenge or fight the enemy. I think more youths are going to carry out attacks to prove to the Israeli authorities that they are not scared of them or their tactics.” Cousins from Shuafat got on the train with a pair of scissors and a knife and stabbed the guard. Motivation: Considered a copycat attack to Ahmad Manasra. Ihab Alqam, Ali’s father, said he first heard of the attack from an older brother who said Ali’s picture was “all over Facebook.” “I am extremely shocked,” Ihab Alqam said. “My son Ali did not seem as though he was angry about anything. In fact he is the one that is spoiled the most” (New York Times). Honored by: Hamas issued a death notice for him. Notice on Facebook page of the Islamic Movement in Jenin. Motivation: His father, Ziyad Abu Garbiah, was a senior Hamas operative in Jenin and one of the terrorists expelled to Lebanon in the 1990s. Honored by: Hamas and the Islamic Bloc in Sanur issued a death notice for Sadek. Death notice issued by Hamas for its “son, the jihad fighter shaheed” (Facebook page of the Islamic Bloc in Jenin) features Al-Aqsa mosque with Dome of the Rock in the background. Death notice issued by Islamic Bloc in Sanur. Background: Shadi Ahmed Mutawa’ told his brother he had carried out the attack, and the brother rushed to tell their father. The two were afraid that the IDF would raze their house and turned in Shadi Ahmed to the Israeli security forces. Honored by: Fatah issued death notice for “fighting shaheed” Shadi (Facebook page of PALDF). Motivation: He confessed he had gone to the roadblock intending to die. Nov. 19, 2015, Three Israelis stabbed in south Tel Aviv. Two were killed and third seriously wounded. Attacker entered the synagogue on the second floor of the building and stabbed worshippers. Background: First terrorist attack in ten years by someone with a permit to work in Israel; originally came from Bayt ‘Awwa. Nov. 19, 2015, Shooting attack with an Uzi submachine gun. Attacker opened fired at Israeli vehicles in a traffic jam near Alon Shvut. Three killed and 5 wounded. Motivation/Honored by: His house flew a Hamas flag. His mother claimed she was the “mother of a hero” (Facebook page of PALDF). Occupation: Was in Israel illegally and worked in construction. Background: She aroused suspicions of the Border Policeman and had a knife. Honored by: Fatah issued a death notice for the “heroic shaheed” (Facebook page of Ayn al-Bayt Fajar). His mother told a local TV station she was “proud of her son, who lifted his head up high.” Fatah issued a death notice for the “heroic shaheed” (Facebook page of Ayn al-Bayt Fajar). Honored by: PA condemned her death. Ismail Haniyeh, deputy head of Hamas’ political bureau, telephoned her father and expressed admiration for the family’s stance and courage. He claimed that she had been killed to liberate Palestine and her death had not been in vain. Hamas spokesman Sami Abu Zuhri condemned her death and claimed it had been encouraged by the Netanyahu government. Her death was a “serious war crime” and such “crimes” encouraged the Palestinian people to continue the intifada (Hamas website). Honored by: Facebook page of the Palestinian Ministry of Health in Ramallah. Motivation: Ahmed Taha has a picture with a Hamas flag. Honored by: Facebook page of PALDF and QudsN. Honored by: Facebook page of PALDF. Honored by: Both Hamas and Fatah issued death notices for him, but he did not belong to either organization. Facebook page of the Al-Fawar refugee camp, and Facebook page of the Islamic Movement in Hebron, Facebook page of Fatah in Al-Fawar. Motivation: On his Facebook page he posted a notice calling himself “Muhammad al-Shoubaki (shaheed on the waiting list).” About a half an hour before the attack he posted the following: “You are honored, dear homeland….You are honored, Al-Aqsa….You are honored, our shaheed #youth_the homeland.” Shoubaki’s Facebook postings called for revolt and terrorism. Honored by: Hamas issued a death notice for him, but his wife said he did not belong to any organization. Facebook page of the Islamic Movement in Jenin. Occupation/Background: Worked in a store in the village, in the past he had worked in Israeli factories. Honored by: Hamas issued a death notice. His wife said he did not belong to any political framework. Hamas spokesman Husam Badran praised the attack because it wounded soldiers. He said such “heroic actions” proved the intention of the Palestinian people to continue the intifada. He also expressed admiration for the shaheeds who “glorify the Palestinian people” and called for more “heroic actions” (Hamas website). Motivation: Devout Muslim. His brother was Shadi al-Khasib, who carried out a vehicular attack in same spot and was killed. Honored by: Fatah issued a death notice for him. Fatah hung a banner on the family house. Hamas spokesman Husam Badran praised the attack. Motivation: He claimed that before he stabbed the Border Policeman the two had argued. Background: According to Palestinian security sources, he had psychological and social problems. Honored by: Hamas issued a death for him. Occupation: Worked at a construction site nearby. Security Record: She was detained after shooting fireworks and trying to stab an IDF soldier at a roadblock east of Tulkarm. Released from jail in Israel on May 21, 2014, after a year and a half. Honored by: Facebook page of QudsN and Facebook page of Shehab. Honored by: Facebook page of QudsN. Palestinian woman, large knife found in her possession. Honored by: Official PA media did not report on Areiba’s affiliation with Palestinian general intelligence, reporting only “the death of a civilian at Himza.” Al-Risala, a newspaper affiliated with Hamas, printed a cartoon making fun of Mahmoud Abbas, who now had to examine his security officers more carefully. Raa’fat Alian, Fatah spokesman in Jerusalem, said that the person who carried out the attack was in fact an officer in general intelligence. He called Areiba a shaheed and a hero and stressed that Fatah opposed security coordination with Israel because it did not serve Palestinian interests. Saeb Erekat, secretary general of the PLO executive committee and a relative of the terrorist, paid a condolence call to the Areiba family. He was accompanied by Majed al-Fatiani, the governor of the Jericho district, and Fatah members from the Jerusalem region. Motivation: Before the attack, he posted pictures of confrontations with IDF forces on his Facebook page. Motivation: Oldest son of senior Hamas activist Sheikh Bassam Abd al-Rahim Hamad, who was imprisoned in Israel a number of times. Background: His parents and other relatives have left the PA and now live in the U.S.
Honored by: Hamas issued a death notice for him. PA held a formal military funeral for him and his coffin was carried on the shoulders of operatives of the Palestinian national security services. Honored by: Hamas issued a death notice for both even though they didn’t belong to the movement. Honored by: Hamas issued a death notice for both even though they didn’t belong to the movement. Facebook page of PALDF. Honored by: Fatah in the Al-Rahm region issued a formal notice for the death of “the son of the [Fatah] movement, the heroic shaheed” (Facebook page of Fatah in Al-Ram). The terrorist’s mother told a local TV station she would be ready to give birth to another Omar every day and willing to sacrifice everything for the sake of Al-Aqsa mosque and Palestine. She said she asked Allah to receive her son Omar as a shaheed. After the attack, there was positive feedback on the Beit Hanina Facebook page. Talk-backers hoped Allah would have mercy on the terrorist and let him rest peacefully in paradise. One post the following morning read, “May peace be upon you. May Allah’s mercy and blessings [be upon you]. The morning is fragrant with the perfume of the shaheeds of Palestine. The intifada of knives continues” (Facebook page of Beit Hanina). Honored by: Family distributed candy to visitors who came to pay their condolences (Facebook page of PALDF). Honored by: Hamas issued a death notice for him. Death notice issued with Dome of the Rock and Al-Aqsa in the background by Hamas (Facebook pages of Shehab, Quds and Islamic movement in Nablus). Honored by: Hamas praised the attack. Security Record: He is a released prisoner. In 2001 he spent a year and a half in administrative detention for his membership in Hamas. Honored by: Hamas issued a death notice for him. Ismail Haniyeh, deputy head of Hamas’ political bureau, spoke to one of his children and expressed his condolences (Facebook page of the Hamas movement in Nablus). Background: Student; carried out attack on way home from school. Honored by: Hamas issued a death notice for him. Motivation: On his Facebook page he posted pictures from events that occurred in Qalandia (riots, funerals, rallies) and calls for violence and struggle. Honored by: Hamas issued a death notice for them. Honored by: Ismail Haniyeh, deputy head of Hamas’ political bureau, called the father to congratulate him on the attempted attack (Facebook page of the Hamas movement in Nablus). Honored by: Hamas and Fatah individually issued death notices for him. Death notice issued by Fatah in Nablus district features Dome of the Rock and Arafat. Motivation: He was a friend of Anas Hamad (killed in vehicular attack on Dec. 4). Left a will in which he stated he had decided to sacrifice himself because he could not bear the “occupation.” Told his mother he wanted to become a shaheed. Honored by: Hamas issued a death notice for him. Relatives distributed candy to people who came to the mourning tent. Background: A school dropout who worked in Israel illegally. Honored by: Hamas claimed both attackers were operatives of the movement and issued death notices for them. Honored by: Hamas issued a death notice for him. Facebook page of PALDF. Honored by: Fatah issued a death notice for her, but she apparently did not belong to the movement. Honored by: Hamas and Fatah individually issued death notices for him. Fatah banner carried at his funeral. Background: Brother claimed he was retarded and as a child had gone to a school for special needs. Followed Jewish worshippers around the Old City and then pulled out a knife when asked for identification. Honored by: Hamas issued death notice. Motivation: During the past six months he posted many pictures of Hamas military-terrorist operatives on his Facebook page. Honored by: PA/Fatah hesitated to call him a martyr due to strong linkage with ISIS-like inclinations. Hamas praised the attacks. “We do not know what the reasons were for Nishat to have committed the shooting attack,” said family member Ahmed Milhem. “We would prefer for him to still be alive, to understand what caused him to kill people like he did.” The family is under suspicion for aiding and abetting his hiding. Facebook pages of Fatah and Hamas praised Milhem. Honored by: Notice congratulating the Hebron sniper and encouraging shooting attacks on Facebook page of QudsN. Motivation/Background: Son of senior Hamas operative Yunis al-Kawazabah. Father was imprisoned by Israel and detained by PA.
Honored by: PA held a military funeral for him. Facebook page of Fatah had his picture. The death notice was issued by Salaldeh clan (on Facebook paged of Sa’ir Our Home). Motivation: He was the brother of Mahmoud Shalaldeh, 18, who died on Nov. 13, 2015, after having been wounded by the IDF in a riot in Sa’ir. Honored by: Both Hamas and Fatah issued death notices for them. Facebook page of Fatah had their pictures. QudsN also had their photo. Facebook page of Sa’ir Our Home. Facebook page of Hamas in Nablus. Motivation/Background: All three attackers came from the same family and same village. PA held a military funeral for all three terrorists, carried by Palestinian national security forces and the Palestinian police force. Background/Occupation: Studying economics at Al-Quds Open University and worked in agriculture to support his family. Honored by: His funeral was attended by many Fatah supporters. Honored by: Facebook QudN has video of his body with people kissing it. Motivation: He was related to the three attackers from the Kawazba family who were killed on Jan. 6. Honored by: Hamas issued death notice for him on Facebook page for Hamas in Nablus. Motivation: He left a letter for his mother asking her for her forgiveness and expressing a wish to kill two Israeli soldiers and become a shaheed. Honored by: Hamas issued death notice for him. The PA organized a formal military funeral for him. Death notice on PALDF Facebook. Honored by: Hamas issued death notice for him. PALDF Facebook page. Quds Network. Shehab news has his picture. Fatah Facebook page calls him an executed martyr. Motivation: His father said his son “had everything in life” and had not acted suspiciously before the attack. Honored by: Picture of him on PALDF Facebook, Shehab News, Al-Quds News. Description: Recruited people for attacks – constant contact with operatives in Gaza. Trained to manufacture explosive belts and IEDs. Recruited two Israeli citizens who were students at Abu Dis University (one from east Jerusalem and the other a Bedouin from Hura). Both students support ISIS. An explosives laboratory was discovered in an apartment rented by Ahmed Azzam in Abu Dis. The Bedouin agreed to carry out a suicide attack. Materials were purchased in Ramallah and Israel. So far 25 cell members have been detained. Members: Issa Nasser Issa Shawka, 19, from Bethlehem, accepted Ahmed Azzam’s offer to carry out an attack. Cell received funds from Hamas. Background: Some members were students at Abu Dis University from Bethlehem. Three recruits said they were will to carry out attacks, two for suicide attacks. Leader: Mahmoud Zaghloul, 32, from Zita outside of Tulkarem, who was recruited directly by Jawad Nasrallah. Description: An initiative of Hizbullah’s Unit 133, which is charged with setting up terror cells in Israel. Israel Security Agency (ISA) called the group very irregular. In addition to Zaghloul, four other members of the cell were arrested. Zita resident Rabah Labadi, 28, who had been imprisoned in an Israeli jail in 2002-2007 and 2008-2011, was also arrested. The ISA and IDF also arrested Muhammad Zaghloul (Mahmoud Zaghloul’s relative), Muhammad Matzarwa, and Ahmed Abu el-Az, all 19-years-old from the Tulkarem area (Times of Israel). The main source used was the Meir Amit Intelligence and Terrorism Information Center. Additional information came from news articles from various sources (New York Times, Times of Israel, Tablet Magazine, etc.). Additional information came from QudsN and Shehab News. Tamara Elashvili is a researcher at the Jerusalem Center for Public Affairs. She is currently studying for her master's degree at Hebrew University in International Relations: Security and Diplomacy.